The situation of nuisance, caused by Culex pipiens L.
tions of ecological factors [2-6,11]. and sanitation systems are generators of deposits of Cx. the ways to fight . 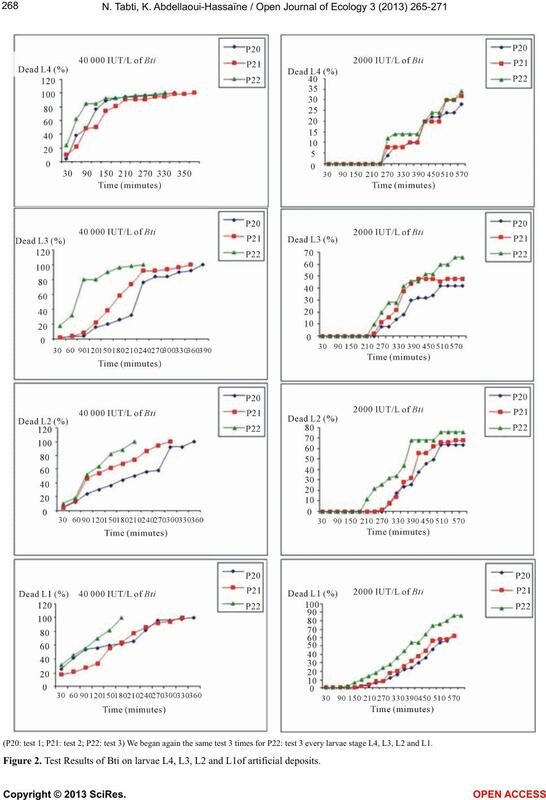 fects on populations from breeding after purification. ture of 25˚C and a photoperiod 14/10 hours . of the same stage) was placed. minutes) until the death of all larvae (100% mortality). larval stages, with a probability of 95%. minutes for the dose of 50 mg/L. sits (Figur es 1 and 2). higher doses, where the larvae are all dead. as purified populations of artificial deposits. tality of Cx. pipiens: probability p < 0.005 (Table 1). 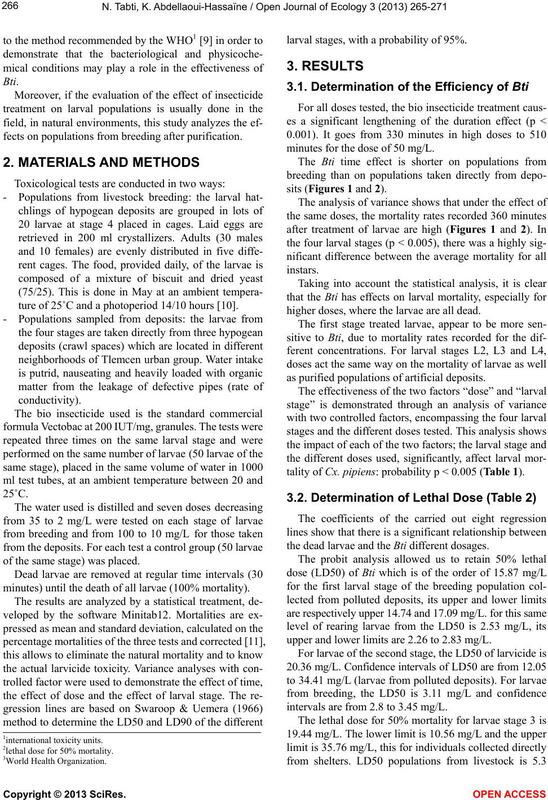 the dead larvae and the Bti different dosages. upper and lower limits are 2.26 to 2.83 mg/L. intervals are from 2.8 to 3.45 mg/L. 2lethal dose for 50% mortality. Figure 1. 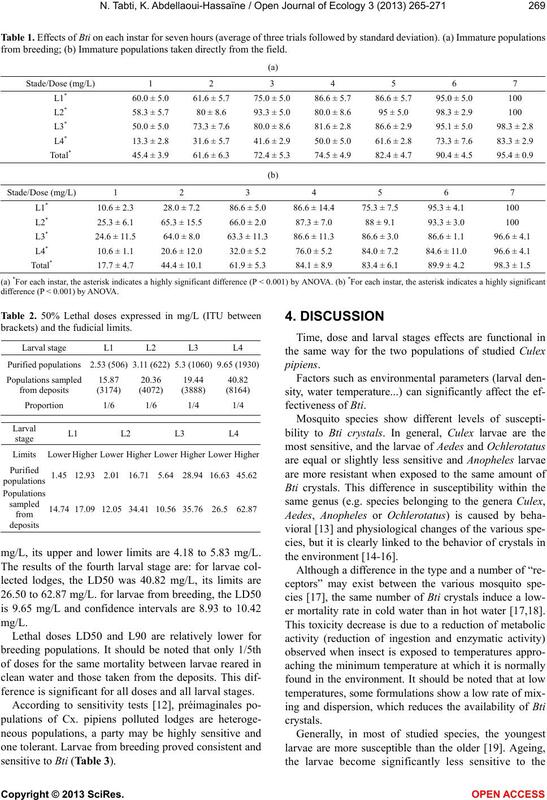 Test Results of Bti larvae L4, L3, L2 and L1 of purified populations. (P20: test 1; P21: test 2; P22: test 3) We began again th e same test 3 ti mes for P22: test 3 every larvae stage L4, L3, L2 and L1. Figure 2. 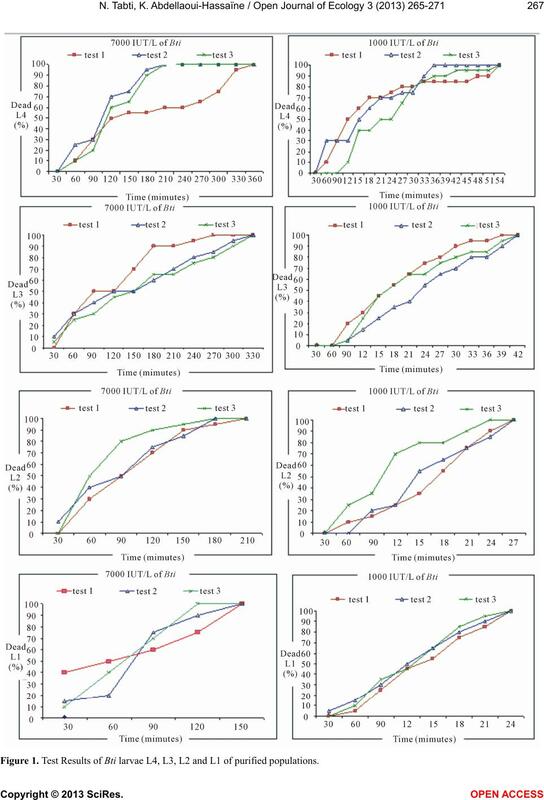 Test Results of Bti on larvae L4, L3, L2 and L1of artificial deposits. from breeding; (b) Immature populations taken directly from the field. difference (P < 0.001) by ANOVA. brackets) and the fudicial limits. mg/L, its upper and lower limits are 4.18 to 5.83 mg/L. ference is significant for all doses and all larval stages. sensitive to Bti (Table 3). er mortality rate in cold water than in hot water [17,18]. deposits; (b) Immature people from breeding. organic pollution also reduces the toxic activity . liferate gradually in epithelial cells. contaminat ed wa ter r ic h in microorganisms. and 90%, significantly higher than those from livestock. These larvae thus have a certain tolerance towards Bti. 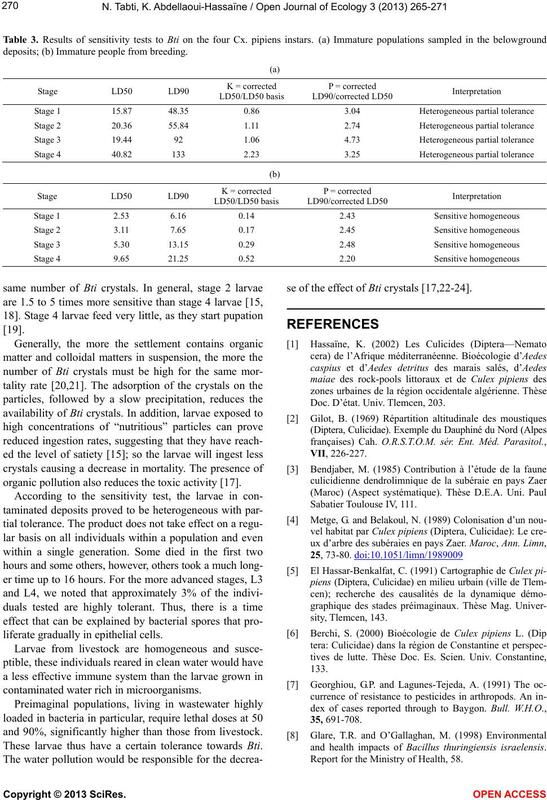 se of the effect of Bti crystals [1 7,22-24]. Doc. D’état. Univ. 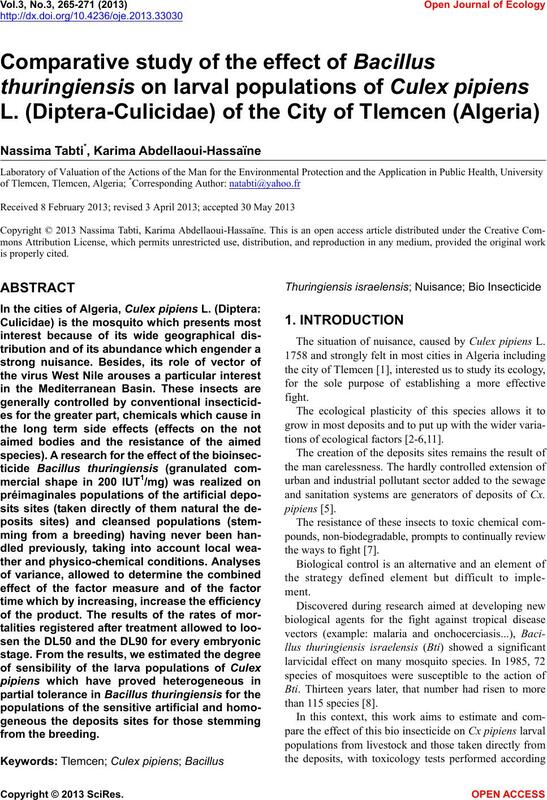 Tlemcen, 203.
and health impacts of Bacillus thuringiensis israelensis. Report for the Ministry of Health, 58. O.R.S.T.O.M. Ser. Ent. Méd. Parasito., 14, 49-59.
as a factor of the effectiveness of a bacterial stomach toxin. Journal of Medical Entomology, 25, 191-196.
ganisms: A review of laboratory and field experiments. 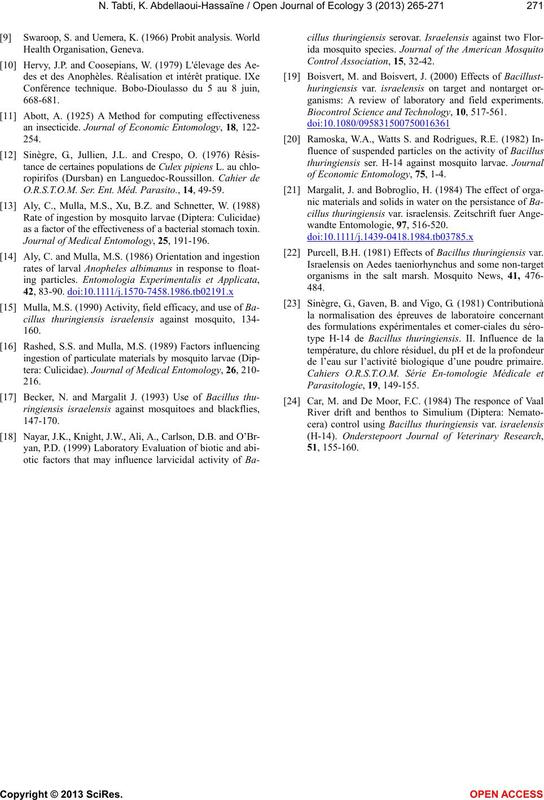 Biocontrol Science and Technology, 10, 517-561.
of Economic Entomology, 75, 1-4. Purcell, B.H. (1981) Effects of Bacillus thuringiensis var. de l’eau sur l’activité biologique d’une poudre primaire.